Step 2 : Now u are in the set console, you can see several options there like Social Engineering attack, Fast track penetration testing etc. Just type 1 and press Enter . This will open "Social Engineering attack". Step 3 : Now another window will appear Just type "2" i.e. Website Attack Vectors . Step 4 : Now another window will appear, Just type "3" i.e. Credential Harvester Attack Method. Step 6 : Now it will ask to input ur Ip address, to find out IP-Address in BackTrack, Open Terminal > Type "ifconfig" . You can view ur IP-Address there. Just check out the image below for more details. After getting the IP input it in SET & press Enter. Step 7 : Now it will ask the URL to Clone. 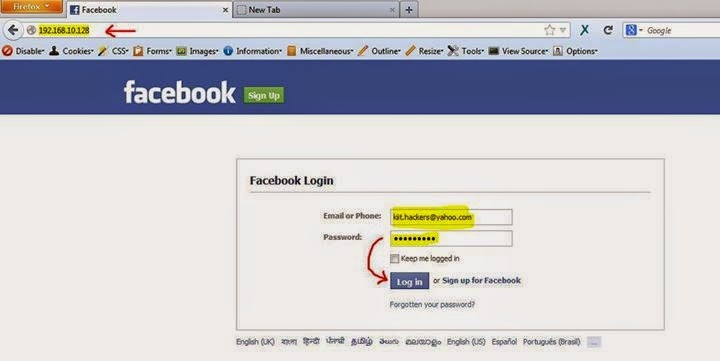 Here you type the URL u wanna hack like Facebook, gmail , yahoo, hotmail, twitter etc. We are using www.facebook.com . Step 8 : Just wait for some moments till the cloning is over. When the cloning is done u r ready to hack other. Just use ur brain to convince people to open ur IP-Adress (mentioned above) or u can also use URL shorteners or convert the IP in Hexadecimal form so that no one gets it. When they will open the ip address , they will get the page shown in the image and as they input the email id and password. it will be shown in ur SET. That's it , this process is called IP Tabnapping. Hope u guyz will remember it next time. Phishing is also the same,no much difference except in phishing we have to copy the whole source to make a new facebook login page and just change the Action value to redirect it to our own page. Any query regarding this comment below.